Research in China has shown that a common hybrid circuit component has potential for use as a micro-actuator. 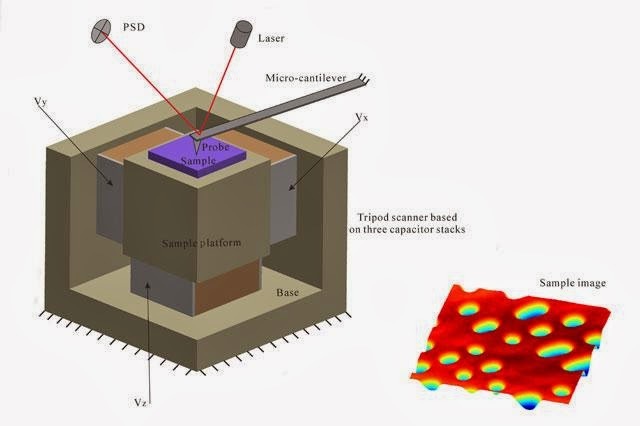 The industrial grade MLCCs tested display surprisingly little hysteresis, suggesting they could be of interest in many microactuation applications including nanoposition for scanning probe microscopes. Micro-actuation used for nanopositioning is important for nanotechnology tools such as the scanning probe microscope (SPM), that make use of micro-actuator nanopositioning systems with resolutions of less than a nanometer and travel ranges of several micrometers to allow researchers to study objects at the molecular and atomic levels. Micro-actuators are normally made from piezoceramic or electrostrictor materials. One of the main issues with piezoelectric units is hysteretic behaviour between applied voltage and output mechanical displacement. This limits their use in high precision displacement tracking applications. Control strategies have been developed to overcome these limitations but none have provided satisfactory performance with regard to all the issues involved, i.e. speed, resolution, robustness and complexity. Electrostrictive devices, on the other hand, suffer far less from hysteresis but are limited by large temperature sensitivity and a highly nonlinear field-strain relationship. A team from the University of Science and Technology of China (USTC) in Hefei believe they have found an alternative solution in a commonly used electronic component – the multilayer ceramic capacitor (MLCC). MLCCs are fundamental electronic components, typically making up 30% of the elements in a hybrid circuit board. 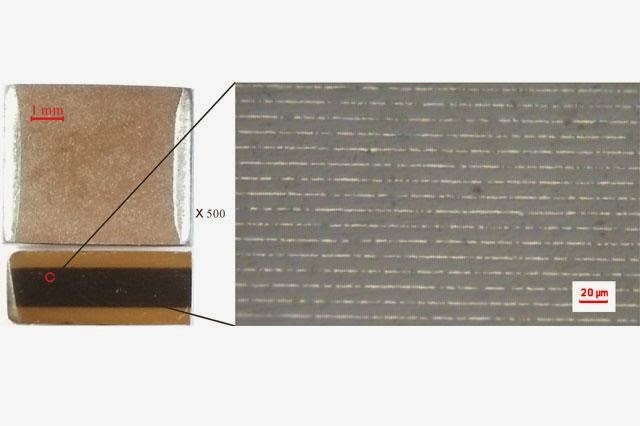 They consist of a monolithic ceramic block surrounding comb-like sintered electrodes, with an electrical contact made by burnt-in metallic layers. There are several classes, defined by the type of ceramic dielectric material used, and it is members of the Class II MLCCs that have caught the USTC team's attention, those known by the designation X7R. X7R MLCCs use mainly ferroelectric ceramics that exhibit piezoelectric effects. However, when used as a micro-actuator they display very little of the hysteretic behavior associated with piezoelectric materials. "The almost no-hysteresis behavior of the proposed X7R MLCC actuators allows simple manipulations in open-loop, high-precision displacement tracking applications. They do not require poling and have much better linear displacement and less temperature sensitivity than traditional electrostrictive materials. MLCC actuators seem to combine the benefits of traditional piezoelectric and electrostrictive actuators," said team member Dr Zhihua Feng . As MLCCs share a stacked construction with piezoelectric stack actuators, but with much thinner dielectric layers, the team suspected that the electrostatic force generated inside the capacitors might be able to deform them. But their experiments showed that only extension deformations were generated, regardless of the polarity of the applied voltage, and calculations showed the electrostatic forces to be too weak to produce the observed strain. So, they theorised that a converse piezoelectric effect might be at work, but experiments showed that the piezoelectric effect in the MLCCs was rather weak. "Since the MLCCs had not been poled it could be the bias voltage that induced the net polarisation in the MLCCs and this was confirmed by the significantly enhanced piezoelectric effect with a DC bias applied on the MLCCs. At this point, we assume that the net polarisation in the MLCCs is due to the DC bias voltage and that the converse piezoelectric effect exists at that state," said Feng. In the first instance, the team believe the MLCC micro-actuator approach may be useful for individual researchers needing high-precision, easy to control, low-cost nano-positioning stages to assist their studies. As MLCCs are made for use as capacitors, piezoelectricity is not a focus in their manufacture, so it may vary from one unit to the next. For larger scale use, comprehensive testing would be needed to study this variability and for better understanding of this phenomena and its mechanisms. As only high dielectric constant ferroelectric ceramic MLCCs have the required behaviour, high capacitances are a necessary feature of MLCC actuators. This would limit applications requiring rapid actuation, as the driving current may be too high. But that leaves plenty of potential applications. The USTC team are investigating these actuators for the lateral scanning stage of a commercial atomic force microscope, and have obtained initial experimental images. "Right now, one of our main goals is to improve performance of a typical SPM. But MLCCs could also act as force sensing elements or even energy harvesting components, evaluations on the potential of the capacitors need to be done. We would like to investigate the possibility of using MLCCs in every area where a traditional piezoelement is used, to benefit from the low driving voltage and cost," said Feng.